jackfruit | Keep It Up, David! I was driving home the other day, and it occurred to me that my kitchen inventory was running low. I need to go to the store, I told myself, and minutes later, an answer presented itself. I was getting my mail, when a single sheet of paper somehow managed to break free from the bundle of Pennysaver circular ads that had been unceremoniously shoved into my mailbox. 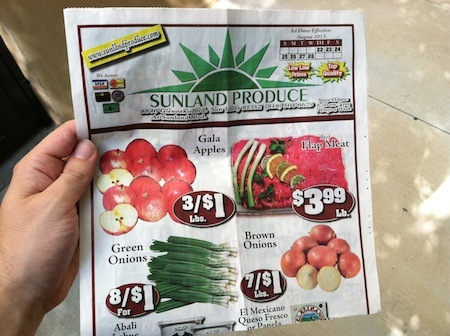 It was for a grocery store I had never heard of, and man, it was advertising killer prices!